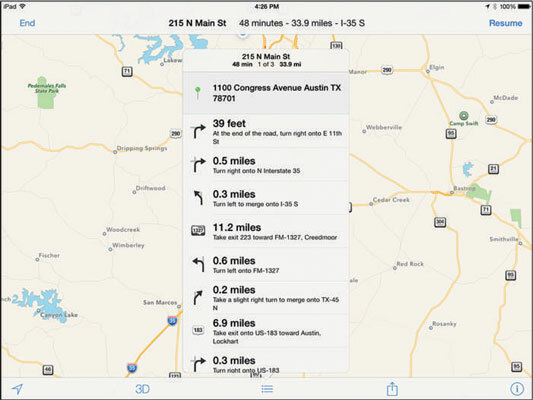 Tell your iPad to get directions for you. When you’re looking at a map screen: Tap the Directions button in the upper-left corner of the screen. The Search field transforms into Start and End fields. If a pushpin is already on the screen: Tap the pushpin and then tap the little i in a blue circle to the right of the name or description. This action displays the item’s Info screen. Tap the Directions to Here or Directions from Here button to get directions to or from that location, respectively. Tap in the Start or End field to designate the starting and ending points of your trip. You can either type them or choose them from a list of your bookmarks, recent maps, or contacts. (Optional) If you need to swap the starting and ending locations, tap the little swirly arrow button between the Start and End fields. (Optional) Tap the car, walking-person, or bus icon above the Start and End fields to choose driving, walking, or public transportation directions. Public transportation directions require a third-party app assist. If you haven’t installed one, Maps so informs you and offers to whisk you to the App Store with an automated search for public transit apps. When the start and end locations are correct, tap the Route button in the upper-right corner of the Directions overlay. Suggested routes appear on the map. 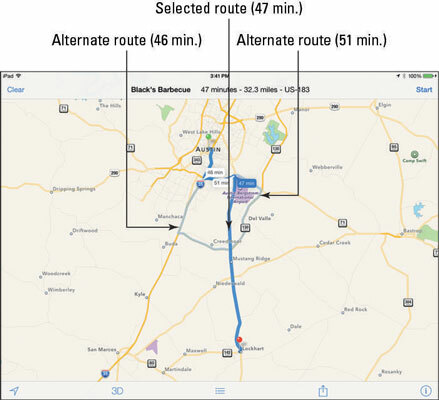 If multiple possible routes exist, Maps shows you up to three. To switch routes, just tap the route you want to switch to. Notice that the text at the top of the screen updates to tell you the time and distance of the selected route. If Maps suggests several routes, select one by tapping its light blue line or balloon. Tap the little i-in-a-circle in the lower-right corner of the map you’re viewing and then tap the Show Traffic button to help you decide which route will be most expedient. Tap the Start button in the upper-right corner of the screen to begin your directions. When you tap the Start button, a series of stark white “road signs” appear across the top of the map, one for each step in the directions. Road signs: Swipe right or left on the road signs to see the next or previous step in your route. The current step is highlighted and a blue circle appears on the map to indicate the location of that step. The other (next or previous) steps are dimmed slightly. 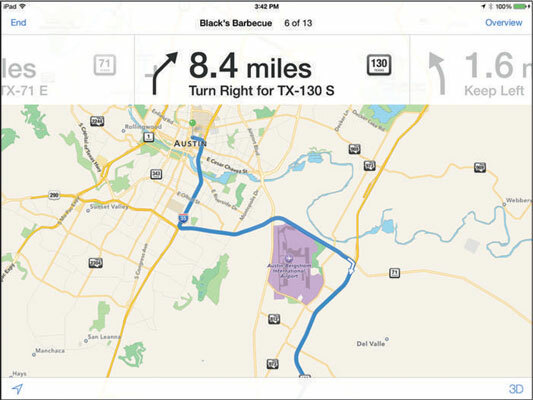 List: If you prefer to see your driving directions displayed as a list with all the steps at once, tap the Overview button near the top-right corner of the screen and then tap the List button at the bottom of the screen, dead center; the steps appear in an overlay. The List button appears on the Route screen, but disappears when you tap Start. Remember to tap the Overview button to make it reappear. Tap any step in the list to see that leg of the trip displayed on the map. If you want to return to the step-by-step road sign directions and map again, tap the Resume button in the upper-right corner of the screen or tap any step in the list overlay. The list disappears and the road signs and map reappear.